One of my dear friends is a new mommy who’s been going a little stir-crazy for the past two months waiting for her son to get his first shots and be allowed to leave the house more regularly. Yesterday, she got a few baby-free hours, which presented a perfect opportunity for some fine dining (or at least what we frugal ladies consider fine dining), and that’s how we found ourselves at a little place called Cafe Mundial in Monrovia. 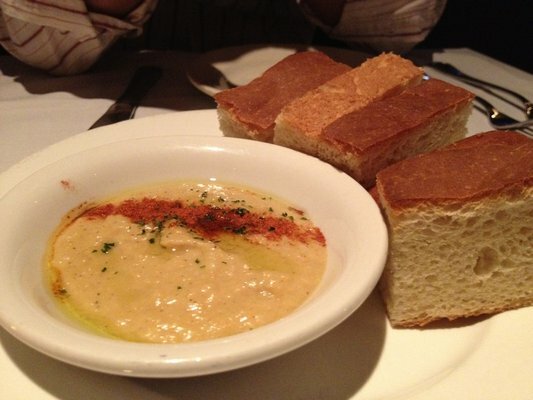 This restaurant serves their complimentary bread with a side of hummus (which is really not to be confused with humus). Much to my delight, when I looked up hummus today, I discovered it has 4 mg per tablespoon. (Side note: if you look up “humus,” which is how WordPress spellcheck thinks “hummus” should be spelled, you’ll find it has no choline. So if anyone ever commands you to “Eat dirt!” tell them, “I can’t. I’m on a choline diet.”) We also each ordered the soup du jour, which was tomato basil. (I have no picture of this, and couldn’t find one from Cafe Mundial.) Not much choline in the soup, but it was delicious! 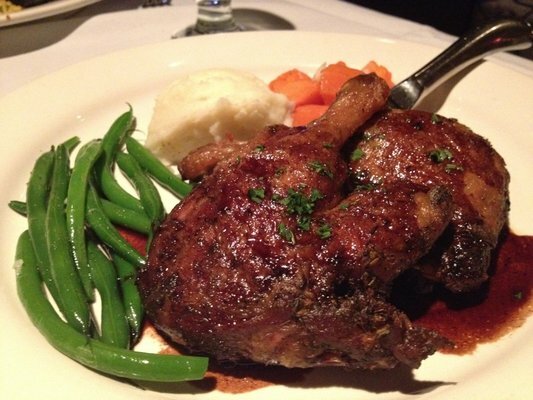 I had the duck conflit, which was accompanied by a small scoop of mashed potatoes and generous helpings of carrots and zucchini. You can see it pictured below with beans instead. Choline count for roast duck: 43 mg for half a pound. Cooked carrots and zucchini add 7 mg and 8.5 mg choline, respectively, for half a cup each. Though I admire the philosophy of “Life is short; eat dessert first,” this isn’t really possible with soufflé, owing to the long prep time. 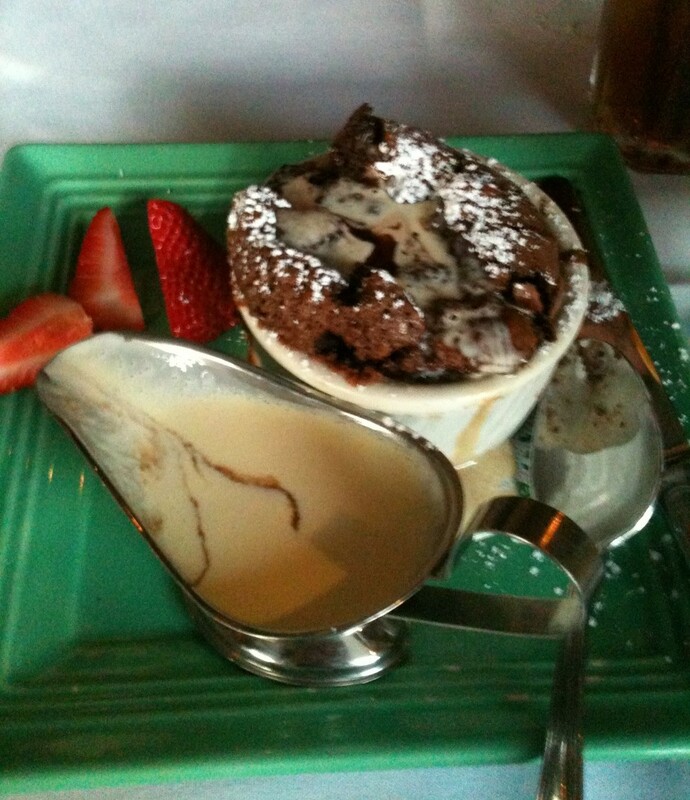 It was more like, “Life is short; order dessert first, or else it won’t be ready.” This one was accompanied by fresh strawberry slices and a vanilla bean sauce. We were a few bites into it when I said, “Hold on, I should take a picture of this.” It was just as delicious as it looks. I couldn’t find any nutritional data for chocolate soufflé, but boring old grocery-store-bakery chocolate cake has about 20 mg per slice. With all the eggs and chocolate in soufflé, I’m guessing this little treat comes it at around 30 mg. So how well did I fare in the choline department? According to my (rough) estimate, I had about 100 mg of choline. My friend, who ordered the filet mignon (77 mg choline in 3 oz), out-cholined me by about 40 mg.
Posted by thetickthatbitme in Choline Diet, Humor. Since I spend a lot of time working from home, it’s difficult to resist a lot of snacking. Now I believe that eating small meals throughout the day is healthy; however, when you factor in my mighty sweet tooth and the fact that my better half keeps visiting the Entemann’s bakery outlet on his way home from work (he can’t resist the deals), well…you see the predicament. So I decided this week that if I’m going to be ‘bad’ and indulge in a few fattening or sugary or salty snacks, I had better make sure I was getting my choline. Here are some of the choline-rich snacks that my research turned up. This is an established favorite for both me and my dad. I used to feel guilty about putting peanut butter on something that is otherwise pretty healthy, but with about 10 mg of choline per tablespoon, I don’t feel that bad. I do, by the way, buy the reduced fat peanut butter. If you prefer almond butter, it has about 8 mg of choline per tablespoon. Carrot ♥ Jif in my kitchen. I’m a girl who likes to play with her food, so these are one of my favorite snacks. Sometimes I like to eat them with a few chocolate chips and some dried cranberries. 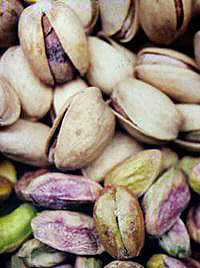 If you’re wondering how many dry roasted pistachios are in an ounce, it’s about 49. 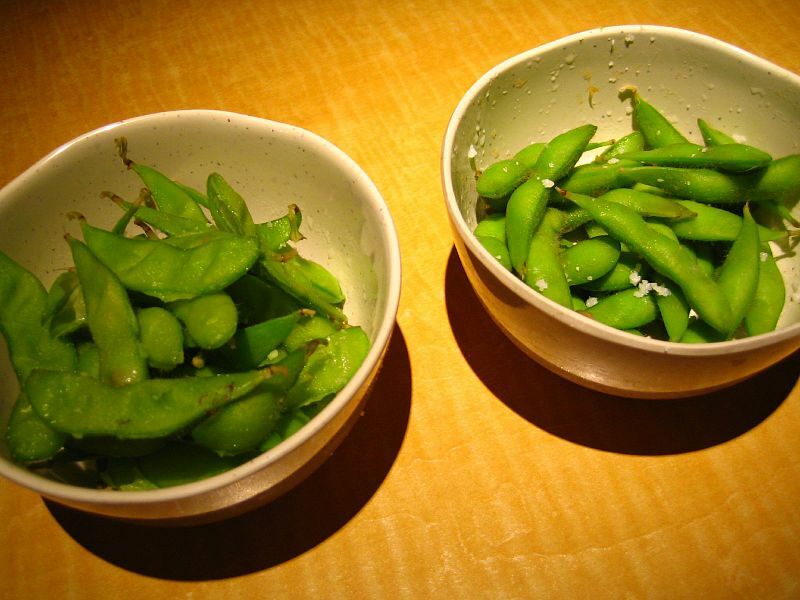 I usually order edamame (boiled soybean pods) as an appetizer when I go out for sushi with friends. Some grocery stores also have it in the freezer section. 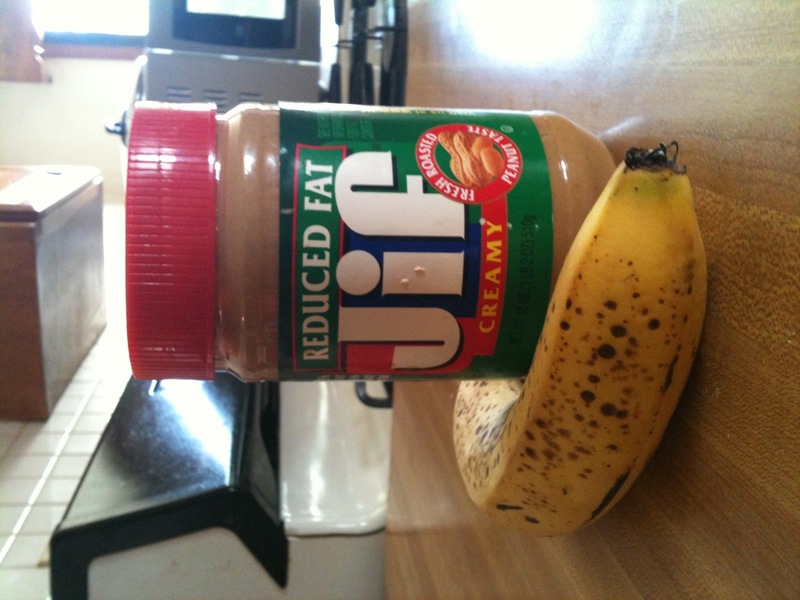 Banana and Jif hanging out on my counter. 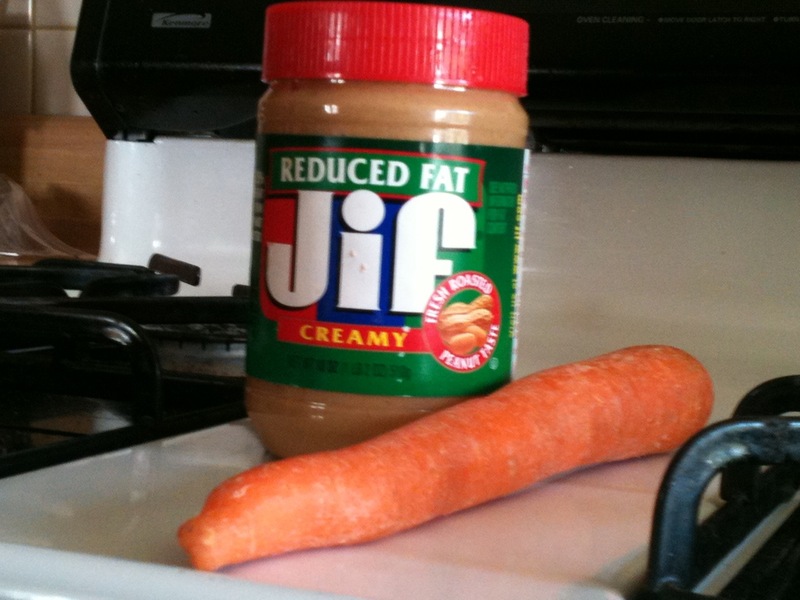 If Carrot finds out, you are sooo busted, Jif! Sweet potatoes are so underrated. I try to substitute them for boring old russet potatoes whenever I can, including when I make home-made french fries. 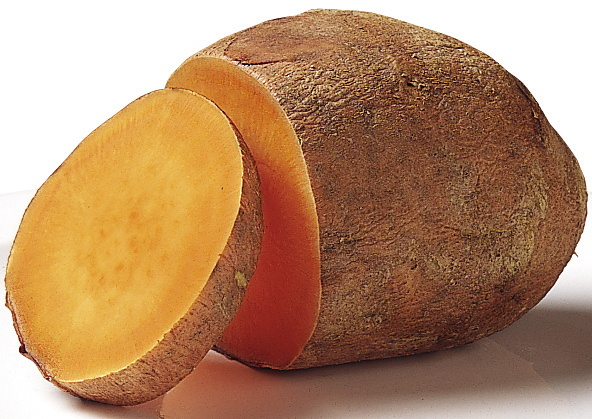 The easiest (and laziest) way to prepare a sweet potato, though, it to stab it with a fork a few times and then pop it in the microwave. I like mine with a little butter and brown sugar, but season salt or garlic powder is also good. Ready for the finale? My most exciting discovery in my choline research is that chocolate is a great source of choline. (Which means, all those times when I was craving chocolate, it wasn’t just me, it was also my neurotransmitters.) I could list about 100 chocolatey snacks here, but I’m going to have some self-restraint and just do one. This one takes me way back to when I was too short to even see over a bakery counter. (Thanks, Mom, for getting me addicted to these at such a young age.) When I discovered this dessert, I considered changing my name to Claire, just so I could be “Chocolatey Claire.” Is an éclair the same as a doughnut? Of course not, silly! It’s far, far better. I recommend a tall glass of milk with this one. 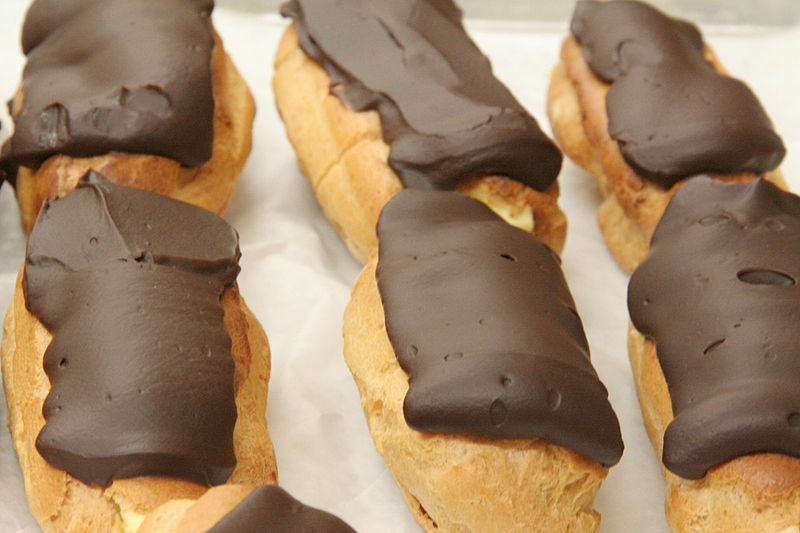 If you want to try making some éclairs from scratch, here’s a yummy recipe over at Moo’s Pantry. That’s all I’ve got for today. What high-choline treats would you add to this list? In my family, omelets are somewhat of a sacred tradition. My dad was the omelet-master when I was growing up, and whenever we had weekend company, he’d make each guest and family member his or her own made-to-order omelet. By the time I was in high school, I’d picked up his technique and was making omelets for all my friends after school. Little did I know back then what a great source of the B vitamin choline omelets can be! (For more on choline, see the Choline Diet page. )The best thing about omelets besides the choline factor is the infinite possibilities–there are no rules about what cannot go in an omelet. Here are some of my favorites. I love smoked salmon, and I’m always looking for new ways to cook with it (aside from just eating it on a bagel with cream cheese–yum). 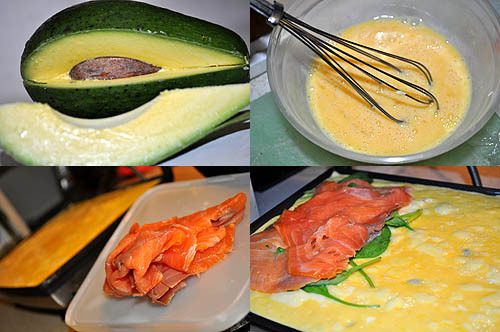 Check out this salmon omelet recipe from cuisineaustralia.com. 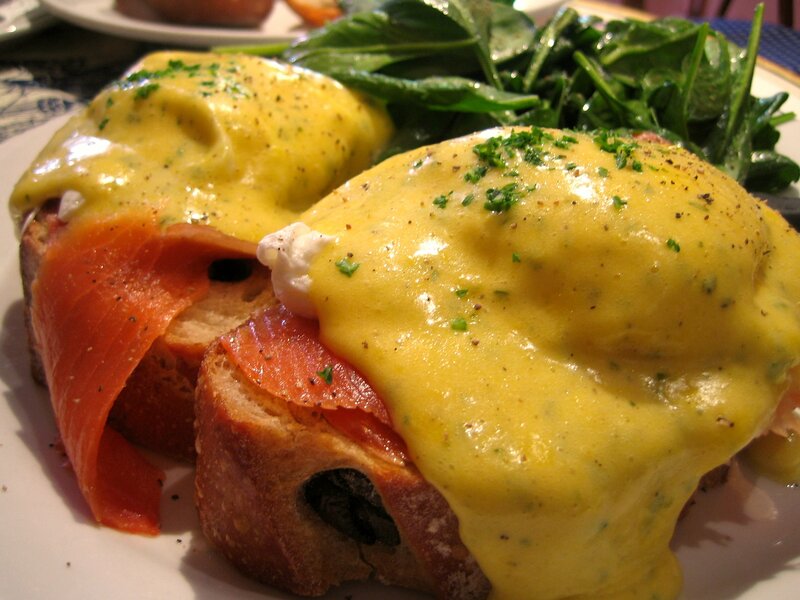 Choline Count: eggs (2) 200 mg + salmon (3 oz) 80 mg + spinach (2 oz) 11 mg + avocado (1) 19 mg = 300 mg of choline! What do I like almost as much as smoked salmon? Crumbly cheeses! Feta and spinach are always delicious together, why not put them in an omelet? Add shiitake mushrooms for a bonus 66 mg of choline! 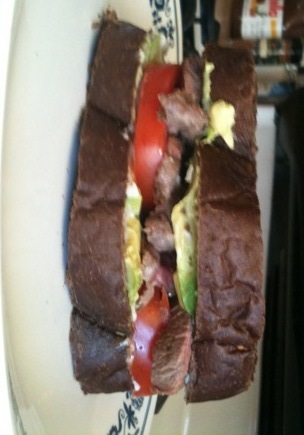 Check out this recipe on closetcooking.com. 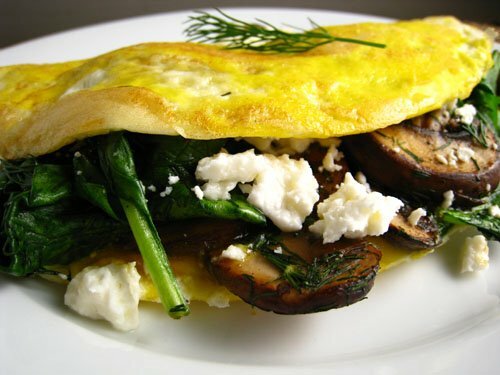 Choline count: eggs (3) 300 mg + shiitake mushrooms (4 oz) 66 mg + spinach (2 oz) 11 mg + feta cheese (1 oz) 4 mg = 381 mg choline! This was my go-to omelet when I was a college student and rarely went grocery shopping or planned meals. I always seemed to have leftover Chinese food in my fridge, so I devised this omelet to make leftovers into breakfast. I usually use two eggs per person with a little milk. If you’ve got the jumbo eggs, you can get away with using one and use a little more milk (1 oz of skim milk has 5 mg of choline!). I whisk up the eggs and the milk in a bowl, then pour them into my omelet pan (yes, they make a size of frying pan that’s just for omelets). Meanwhile, I heat up the leftover stir-fry in a separate pan. Once that’s heated through and the egg mixture has set in the pan, I spoon some stir-fry onto one side. After a few minutes, the other side will be ready to fold over. 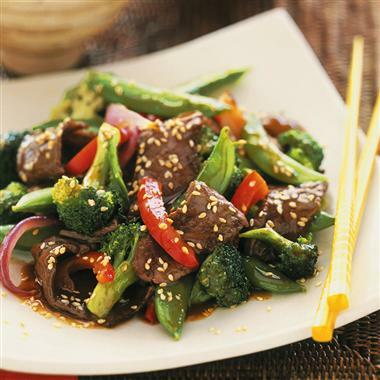 If you want to make a healthy stir-fry at home to use for your leftovers, you can try this recipe for Orange Ginger Beef Stir-fry from mccormick.com. Choline count: eggs (2) 200 mg + beef sirloin (1/4 lb) 96 mg + broccoli (1/2 cup) 31 mg = 327 mg choline! Hope you enjoyed this week’s high-choline recipes. Eggspect (sorry, I promise I’ll try to stop) to see more next Sunday! 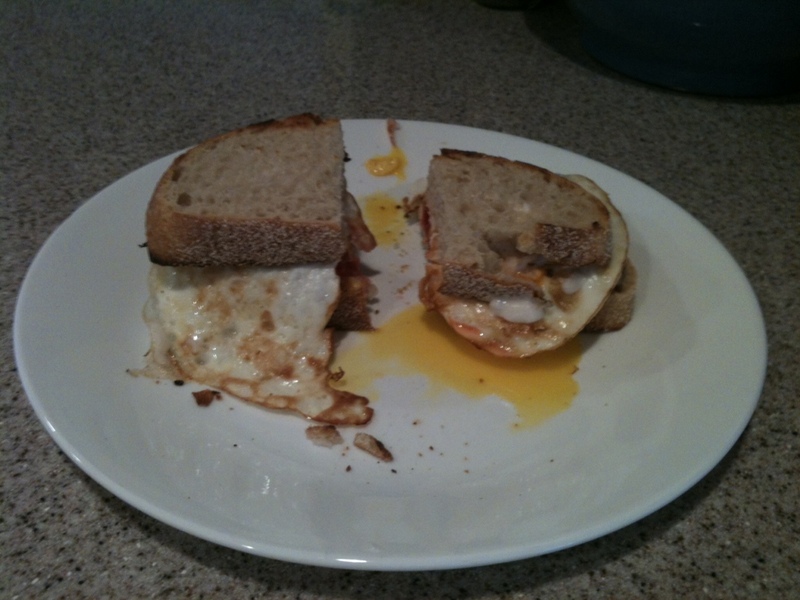 Have a high-choline recipe (and mouth-watering photos) you’d like to showcase on this blog? E-mail thetickthatbitme AT gmail DOT com. If you know my story, you know that when I was diagnosed with B. hermsii and Anaplasmosis, my doctor put me on a high-choline diet. Why choline, you ask? 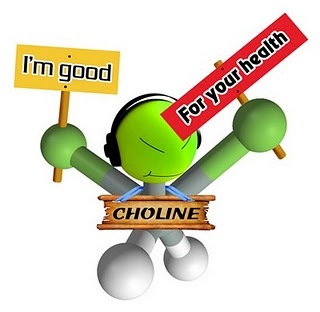 Choline is a B vitamin that aids in the transmission of nerve impulses from the brain through the central nervous system–this process is essential to functions like memory and muscle control. Since Borrelia like to attack the central nervous system, choline is especially important for people with (past and present) B. hermsii and B. burgdorferi infections. People who eat diets high in choline have also been shown to have lower levels of inflammation (like inflammation of the joints in Arthritis) than people who don’t. You can read more about choline here. Enter the Benedict. It is by far my favorite egg-based dish, and I enjoy making it at home just as much as I do eating it for brunch in a fancy restaurant. 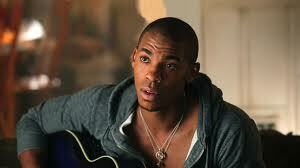 "Eggs" Benedict Talley (Mehcad Brooks) from HBO's True Blood. Photo via hbo.com. One large poached egg has 100 mg of choline, so if you eat two, you get about half of your recommended daily amount (425 mg for women, 550 mg for men). Add to that other high-choline foods like smoked salmon (129 mg), Canadian bacon (39 mg), portabella mushrooms (39 mg), spinach (35 mg), asparagus (23 mg), avocado (21 mg), and tomato (6 mg) to get your choline fix! brings back all kinds of fond childhood memories. A toasted whole-wheat English muffin, topped with pan-fried Canadian bacon and over-easy eggs (make sure they’re still a little runny, because that’s the best part). The hollandaise sauce I usually make with one of those sauce packets you can find in the grocery store (next to the gravy packets). It’s easy–you only need to add milk and butter–and, in my opinion, it tastes better than the from-scratch hollandaise recipes I’ve tried. Because of the butter and bacon, this is a slightly fattening meal, so I balance it with a side of boiled asparagus, which tastes delicious with the hollandaise sauce and adds 23 mg of choline to this meal! I’ve never made this one at home, but I’ve had it at Toasties Cafe, and it is delicious! 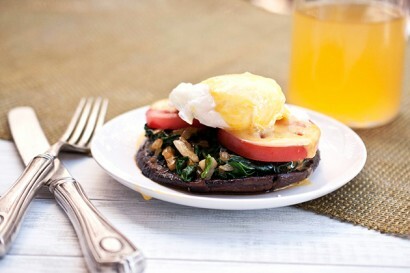 If you’re looking for a meatless meal or just craving these yummy mushrooms, this is the Benedict for you. Check out Jackie Dodd’s recipe at TastyKitchen.com, which also includes spinach, tomatoes, and Sriracha for a kick! My mouth was watering as I scrolled through SoupBelly.com’s deliciously illustrated recipe for this west-coast Benedict. If you want to make it even more California, use sourdough English muffins. This one may seem a bit fishy, but I assure you it’s delicious and packed with choline. It’s also called Norwegian Benedict. Here’s a recipe at food.com that includes not only salmon but spinach, too! 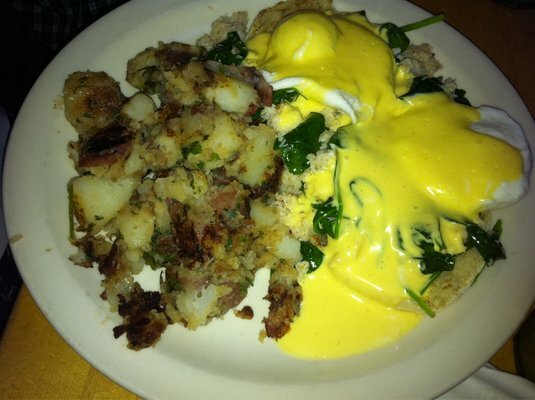 Now that I’ve made myself really hungry, I’m going to go make my own Benedict. 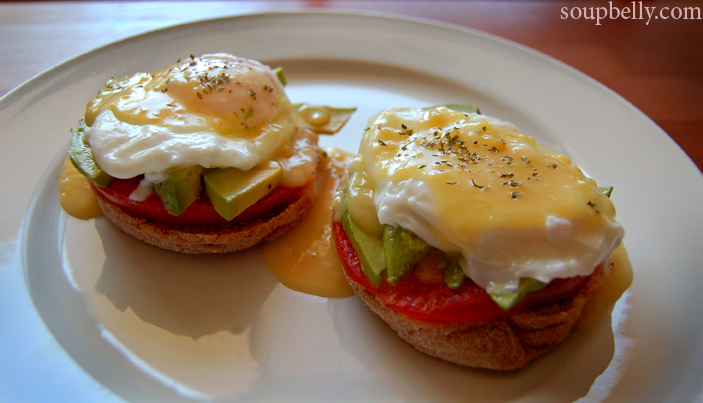 Hope you enjoy these eggcellent (sorry, I couldn’t resist) high-choline meals!